2015 is shaping up to be a very exciting year for drones and aerial media. 3D Robotics recently announced their latest product as “Solo: The Smart Drone”. Interestingly, it will be available starting in May, here in North America at over 500 Best Buy locations, B&H, Fry’s, REI, InMotion and Empire RC. In Canada, it will be available in Best Buy and London Drugs. According to 3DR, the Solo earns the “Smart” moniker due to its use of 1 GHz processors in both the vehicle and its controller. It includes a bevy of built-in safety and support features. Starting price will be $999.00. Presale info HERE. Solo’s intelligence unlocks powerful and one-of-a-kind computer-assisted Smart Shots (patent pending). A pilot can set up the exact shot they want in real time, then tap “play” on the app and Solo will execute it with a level of precision and a soft touch that even seasoned cinema pilots can’t match. And with a list of Smart Shots to choose from, the perfect shot is always just a few taps away. Cable cam and Orbit allows users to create a known and safe flight path along a virtual track in space, freeing them to shift their focus to getting the shot they want; or they can simply hit “play” and let Solo fly itself and simultaneously work the camera for them as smoothly and expertly as a real cameraman would. Follow mode allows pilots to go completely hands-free, while Solo keeps up with their every move. Solo also features a one-touch aerial Selfie for a dramatic and customizable establishing Smart Shot of the pilot and their surroundings. It’s all in service of Solo’s guiding principle: Get the shot. Every time. 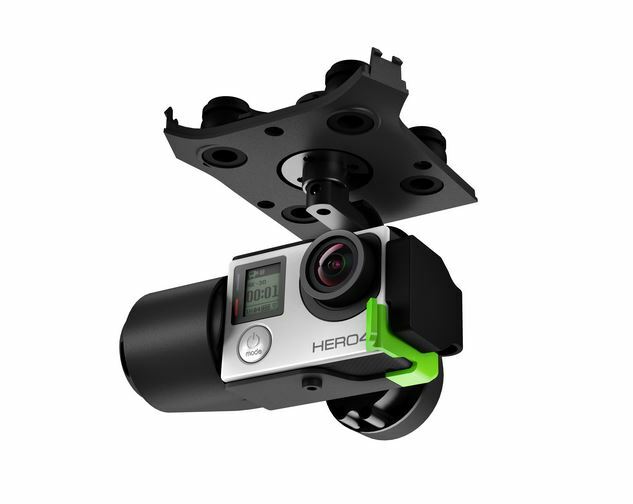 3DR worked closely with GoPro®, the world’s most popular action camera company, to make the first gimbal capable of fully controlling the GoPro. Solo gives users the exclusive ability to start and stop recording video while in flight, which means that when it comes time to edit, they will you have a reel of “fat free” GoPro footage and no longer have to deal with huge, cumbersome file sizes. 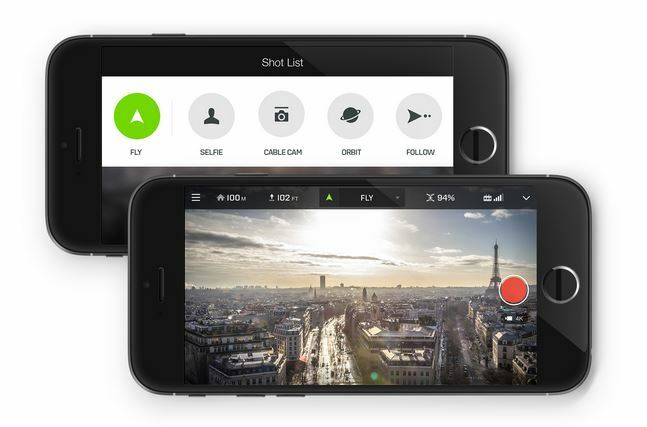 Pilots can also snap photos, change FOV, FPS and exposure compensation and much more—through Solo’s mobile app at long range, or dedicated buttons on the controller. The 3-axis Solo Gimbal stabilizes the camera to within 0.1 degrees of pointing accuracy and powers the GoPro the whole time so the camera’s battery won’t die midflight. 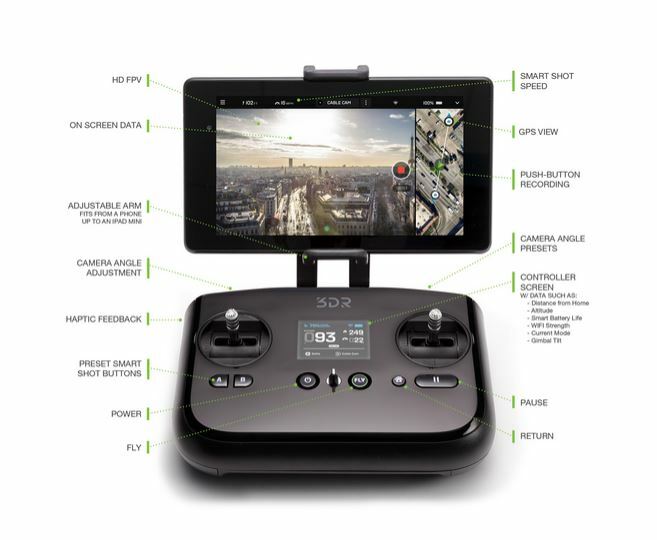 Combine with Solo’s controller and get fine-grain tilt control, including angle presets and instant speed adjustment; or a user can just hit “play” on the mobile app and let Solo’s computer fully control the gimbal for the perfect shot. The Solo Gimbal delivers all of these advanced capabilities while providing a painless and tool-free method of installing and removing the GoPro. 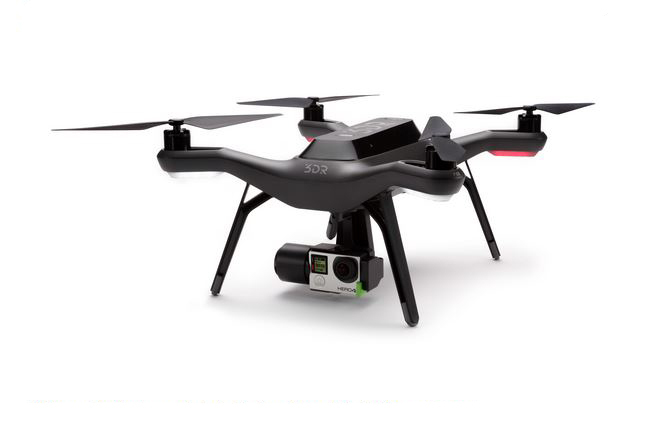 3DR even includes The Frame by GoPro installed with Solo, so a user can easily snap in their GoPro and get a live HD video feed out of the box, without a gimbal.